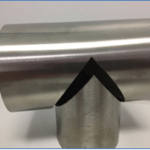 Warping and distortion when welding metals is a topic we have discussed before but it seems to be one of the biggest overall issues that our customers misunderstand. Welding metal materials is not “gluing” pieces of metal together, although that is sort of how it seems. Welding is basically melting metals together—for steel, those melting temperatures, without getting overly technical, range at approximately 2,500 degrees Fahrenheit. The color of the metal, during the process, will give a good clue to just how hot the joining metals become. Bright yellow and you are over 2000 degrees. Red is around 1200 degrees. Most people might naturally begin to understand that introducing that type of heat, along with rapid cooling, is a recipe for warping and distortion. There are ways, of course, to mitigate warping but sometimes, particularly fabrication assemblies that have high dimensional tolerances (or aesthetic tolerances for architectural designs) the engineers or designer may be asking for something that is nearly impossible. 1) Avoid Over Welding—this is a big one! Solid, thick welds look pretty but can warp the heck out of metal particularly on thinner materials. 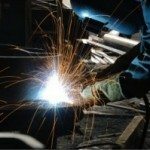 2) Use Intermittent Welding whenever possible—this is commonly referred to as stitch welding. It allows for parts to have little segments of weld rather than continuous welds. 3) Well-planned Weld Sequences—this process allows for welding along different segments of the assembly so all the heat does not collect in one point for a long period of work. 4) Clamping and Jigs—locking parts into place while welding is the most commonly used method of minimizing warping but it is not a fix-all. Parts will often move once they are removed from the clamps (hopefully not as much as if they were welded in free form). 5) Allowing for Warping—which means presetting the parts anticipating that they will move or warp, hopefully into place. 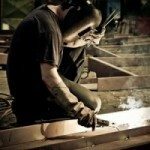 Metal welding is not a new trade—craftsman have been mastering this work for years and can do amazing things…sometimes impossible things. Still, there are limits. Engineers and designers would be well served to consult industry experts as they design and detail parts to make sure they are, in fact, workable and weld-able! 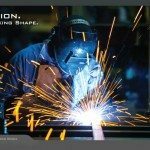 Contact All Metals Fabrication today!